A pre-wedding photoshoot is a wonderful way to live that ultimate wedding fantasy that was on the playback mode since your childhood. It could be—you sleeping in an oyster shell, and the prince of your dreams opening it to discover you, a walk on the beach with your beloved or exchanging a romantic kiss in the deep-blue sea. But what makes these moments stand out is the selection and utilisation of the wedding props. Everyone invests in a good wedding photographer, location and outfits, so why leave the pre-wedding props? It’s time to ditch those old-school wedding props and experiment with these absolutely ‘fun’tastic props to make that click—stand out! Ever wondered how your best friend has managed to get his pre-wedding pictures done with the Seven Wonders of the World as the backdrop? Well, thank green-screen technology for this magic! It lets you shoot against a green backdrop (a cloth) and a digital version of you is created by an editor. So, crush those giant mountains under your thumb, strike the famous romantic pose on the Titanic, set a date on the moon amongst glittering stars or ride on a dolphin with your partner! How about that? Fun and unique! Imagine the silhouette touch to your wedding photograph in the bright sunlight or the romantic moonlight. This technique allows you to experiment with both—a bride or groom’s portrait and couple photography. Besides this, you can also make animated forms or hearts with your hands on the rocks, stand against sprawling landscapes or capture yourself in front of a snow-laden mountain! Whether it’s a vintage wedding car, your mom’s bridal jewellery or your cute little pet—add a personal touch to the wedding photograph by capturing your most-prized possession. Whenever you stroll through the wedding album, this particular photo will definitely brighten up your face. Now these could be a set of funny, over-sized Grandma glasses, carnival masks or humoristic characters—put them on and rock the show! You can get the gang of bridesmaids and the groomsmen involved and strike tons of funny poses wearing them. Take a rustic ride on a tanga or bullock cart with the groom. Even better, let him ride, while you sit like a Princess at the back. Similarly, go for a ride in an auto rickshaw—Dabang style! Vintage rides are a super cool pre-wedding prop that not only add character but also a strong personality to the click. It also brings out the aspiring actor in you. This is your only chance to be a Wonder Woman or the fastest man alive, aka The Flash! Get inside these crazy superhero costumes and make your wedding guests save the date! First, ask the members from your family to form a ‘Justice League. Then, in a ‘V’, ‘U’ or a straight line formation, make them hold the banner of your wedding day. Unleash the hero in you and save the world with your second half. It’s a very interesting prop to use for a pre-wedding photoshoot. 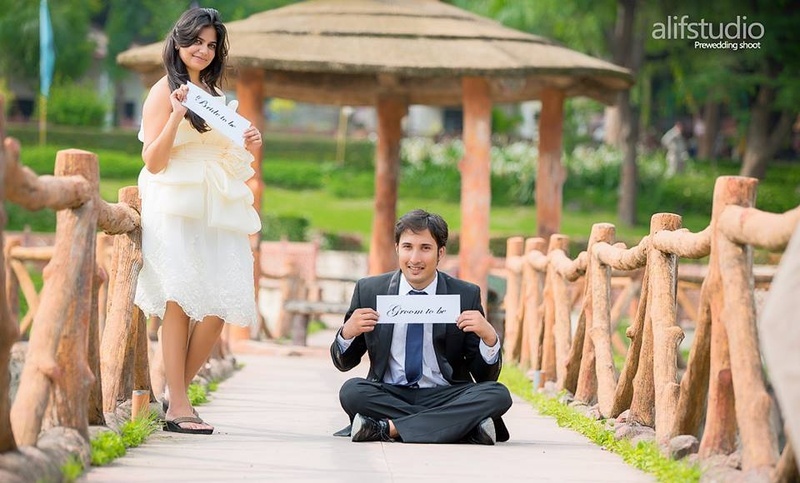 Though your pre-wedding photographer will most probably give you a bride or groom’s getting-ready shot. You can place a giant mirror outdoors and capture several fragmented or solo portraits. You can play around with reflections to capture a superb wedding photograph. Your pre-wedding photography should not just be about props, so you can make those ring bearers and flower girls close their eyes—while you go for that special kiss! You can also seize their adorable expressions in numerous ways by including your nieces and many other little angels from the family. Such clicks turn out to be the most amazing ones! No matter how better and fancy your wedding props are, if you don’t hire a professional candid photographer then you might not be able to get the click that you imagined. Also, ensure that you and the pre-wedding photographer are on the same page to get the desired results. A small tip for those considering a pre-wedding photoshoot — make a note of the poses you are comfortable with in front of the camera. Also, go over the prop checklist to ensure that you don’t miss out on any. Enjoy every moment and smile, as that’s what counts at the end of the day.